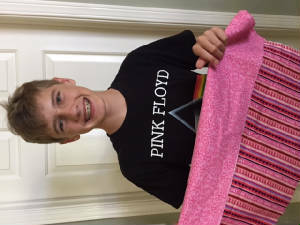 Got into helping making pillow cases after his twin sisters were doing them until they left for College. Was so excited to see this become a family affair for sure. Thanks so much for joining in Ricky !! Great job !!! Lorraine at 92 years old, helped pick the fabric for the pillowcases that her daughters sewed. What a sweet Mother and Daughter project. It's so wonderful to have you all involved. Thank you Lorraine for your great choice of fabrics.